With a stay at Courtyard by Marriott Myrtle Beach Barefoot Landing in Myrtle Beach, you'll be within a 5-minute drive of Barefoot Landing and Alabama Theatre. This hotel is 9.5 mi (15.3 km) from Ripley's Aquarium and 9.9 mi (15.9 km) from Broadway at the Beach. Make yourself at home in one of the 157 air-conditioned rooms featuring refrigerators and microwaves. Smart televisions with cable programming provide entertainment, while complimentary wireless Internet access keeps you connected. Bathrooms have complimentary toiletries and hair dryers. Conveniences include phones, as well as desks and complimentary weekday newspapers. Enjoy a range of recreational amenities, including an indoor pool, a spa tub, and a fitness center. This hotel also features complimentary wireless Internet access, concierge services, and a fireplace in the lobby. Enjoy a meal at The Courtyard Cafe or snacks in the hotel's coffee shop/café. Wrap up your day with a drink at the bar/lounge. Cooked-to-order breakfasts are available daily for a fee. 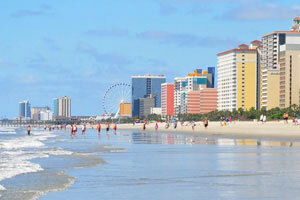 The preferred airport for Courtyard by Marriott Myrtle Beach Barefoot Landing is Myrtle Beach, SC (MYR).